On the 28th of May, the CISPES Solidarity Cyclers Ride for 2018 returned to DC after three days and about 170 miles on the road. This year, the route was changed to avoid flooding or flood-damaged trails in Fredrick, MD. The normal route is 180 miles, this year's route was a bit less. 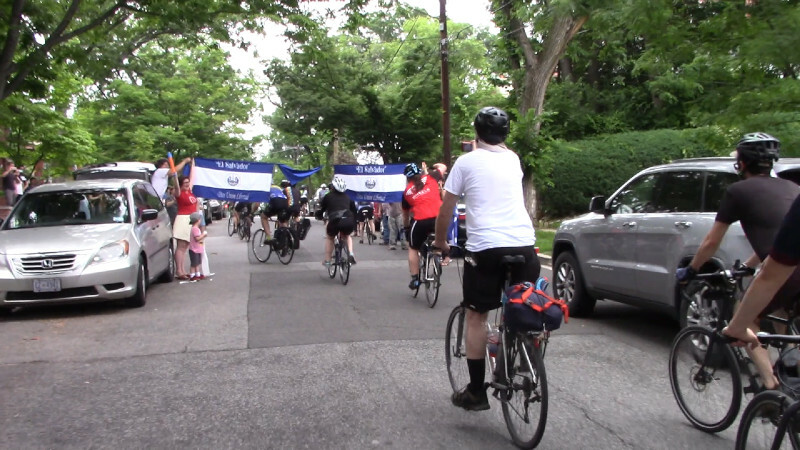 The ride raised about $14,000 for CISPES and their solidarity work for hard-pressed Salvadorans and Salvadoran migrants. During the final portion of the ride, a photographer managed to remove an illegally posted "build the wall" sticker left on a trail structure by a racist Donald Trump supporter. The ride ended at a welcome party not far from Rock Creek Park. The focus of the ride was to raise funds for CISPES's grass roots campaigns. At the welcome party the crisis created by Donald Trump's revocation of TPS or Temporary Protected Status was brought up. Trump is threatening hundreds of thousands of Salvadorans with deportation unless they either find another status, break off all contact with ICE and the U$ goverment, or leave on their own. Still more migrants from other nations such as Haiti are similarily under the gun for Trump's racist roundups. This of course is a down payment on Trump's threats and campaign promises to deport as many as 11 million people. If Trump succeeds in this, it will be another Trail of Tears and will catapult Trump into the status of possibly the worst US President who ever lived. Right now that position is still held by Andrew Jackson, the man as responsible as anyone for the Indian Removal Act and the ensuing Trail of Tears. This was the murderous forced relocation of Cherokee and other Indigenous people from the SE portions of the lands stolen by the United States from their rightful Indigenous owners. Make no mistake about it, the incredible hate shown by so many whites on Turtle Island for migrants from Mexico and Central America is directed at their Indigenous ancestry. Donald Trump himself singled out Norway as a country he would like to see more immigration from, to the great consternation of many Norwegians. Norway yes, El Salvador no is clearly a judgement based on race, part of Trump's silently dog-whistled promise to "Make America White Again."